Those pesky animals have escaped from the barn again and Farmer Fran is nowhere to be found! Click here to play! You are the only one on the farm who can round up those crazy critters before the wolves come out at sundown. There are lucrative winnings on offer if you can gather the animals in the right order, so hop to it! 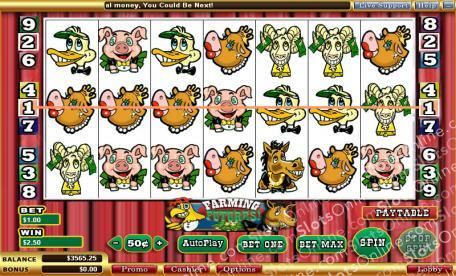 Farming Futures is a 7-reel slots game that can be played over 9 pay-lines. The farm animals are your best friends if you can control them, and if you manage to get 7 Farmer Fran symbols you will be handsomely rewarded; 2500 times your initial bet, in fact. The animals (pigs, goats, cows, ducks, and horses) pay out in ascending order depending on how many you can land in one spin. Just remember that you need at least 3 of the same animal to appear at any one time for a payout. No need to wake up early to be a farmer here, Farming Futures is a simple, fun, and profitable slots game that is sure to get you in the mood for a hoedown.